The Liberty Grand is one of the many wedding venues owned by Liberty Entertainment Group which also operates Casa Loma. 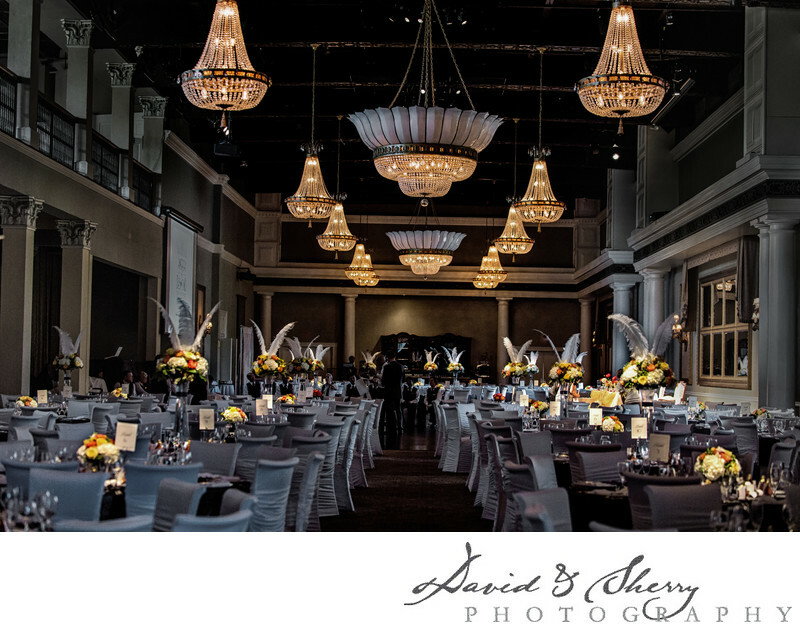 This fantastic venue is capable of being designed in many different themes as it was for Andrea & Desmond's Chinese and Traditional Canadian Wedding with an art deco theme. If you are looking to have 300-400 guests at a luxury wedding venue in Toronto with history and beautiful architecture you don't have very many options. The Liberty Grand is the best venue for large weddings with it's gorgeous courtyard, huge reception halls and dance floors that can be filled with hundreds of guests while still having room for a seated dinner without having to move tables. With this stunning decor and large table center flower arrangements Andrea & Des entertained all of their family and friends with classic elegance and style. Theatrical smoke filled the dance floor during their first dance and the parents dancing with the bride and groom was surrounded by hundreds of standing loved ones. As an architect and bride Andrea's view of her wedding was to be designed like one of her gorgeous building projects with each and every detail taken handled with care. The details included fantastic large floral arrangements pin lighted on each table, roses, lillies and feathers. The save the dates were fit to match the backdrop of their photo booth, the spot light on the dance floor with their names was the same design as their cake and the entire wedding tied together beautifully. The balcony in the main hall was used for some beautifully lit night portraits while the courtyard was used as a space for guests to exit the room and enjoy each other's company while outside for fresh fall air. I would definitely recommend the Liberty Grand when searching for a venue to host weddings in downtown Toronto near the water.